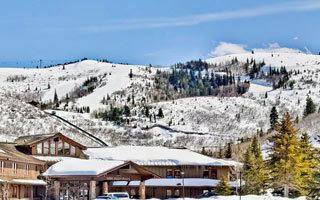 Enclave condominiums are located one-quarter of a mile from Silver Lake Village, mid-mountain at Deer Valley Resort and within a short walk to the free Park City Transit route. These townhome-style condominiums feature a fully equipped kitchen, fireplace, washer and dryer, private outdoor hot tub, decks, complimentary wireless Internet and underground parking. The Signature Collection's complimentary in-town transportation, provided by Cadillac, is offered during the ski season. Condominiums feature a full kitchen, living area, fireplace, underground parking and are located in the Silver Lake area of Deer Valley Resort. These three bedroom condominiums feature a full kitchen, living area, fireplace, underground parking and is located in the Silver Lake Village at Deer Valley.